EcoFonts - Font Styles that Saves Printer Ink | TonerGreen - Eco-Friendly Toners from the U.S.
On our previous article "How to Save on Your Printer Expenses this School Year", one of the tips that was given there was to use font styles that saves your printer some ink. And that's going to be our focus this day, the "eco-fonts". The term "Eco-font" was actually a name of a free typeface that promises to reduce your ink use by up to 20 percent and is available for Windows, Mac and Linux-based operating systems. It is basically a font software that typically looks like the regular Arial but with one difference--each letter has lots of little holes punched out of it, requiring the use of less ink for it be printed. But since eco-font isn't a free software anymore, printer users and type designers resorted on trying font styles and observing which ones were likely to save ink when used for printing. 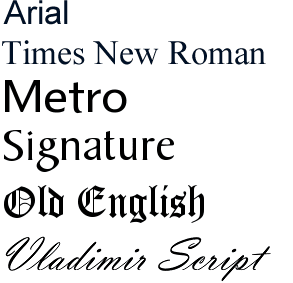 One study done that was done by Printer.com, a Dutch independent printer comparison website, focused on ten frequently used font styles and found out that Century Gothic came in first with the highest total savings per year of 31 percent. One Canon inkjet printer and Brother laser printer was used to see how much money could be saved by using those ten different fonts. Both printers were set at their default resolution setting of 600x600 dpi (dots per inch). Looking for ways to save more? Then perhaps its time to shift using remanufactured toner cartridges and ink cartridges for your printers. These quality refurbished printer cartridges can save you about 40% of your printing expenses without having to give up on your printer's quality and page capacity. With remanufactured printer cartridges, you can enjoy affordable quality printing and 100% satisfaction.